Hi, I am Yaso Browne an Editor for DAUK and I'm very happy to introduce you to our DAUK Christmas wish list. ”What is this about?" You may ask. Well, I'll tell you! We are doing a DAUK Christmas countdown where each of the team will blog on one of the 10 days leading up to Christmas. It's a way for people to get to know us, (especially new people like me), but hopefully also to share in things whether that is something funny, poignant or just random! So what's on my Christmas wish list? Well, just very practically speaking I hope I get something from my actual Christmas present list of books particularly "Corbynism", always good to be prepared mwah ha! A “present list?” you may say with indignation - if it helps it is just suggested. It's really interesting seeing people approach buying or choosing Christmas presents in systems that are as guarded as traditions, have you ever thought that? Some people do themes, some people do very prescriptive lists, some do an exchange of cash in the way of gift vouchers, some do secret Santa others do £10 budgets and shove everything else in the stocking, “what stocking” others say? With some confidence though I believe no matter what we all get socks! Then it’s the actual traditions like when is it legitimately ok to open the presents? Don’t get me started!! If you are like me once married you have had to revise things a little, compromise a bit and say “ho ho no!” on occasion. I think the expectation of “what food is a must” is a low threshold arena for most and I’ll leave it there, “roast potatoes". Furthermore, for many, Christmas will be another day in isolation or in battle. We don’t all have networks we feel we can rely on, it’s certainly not on prescription. However, we often see that this is commonly what is lacking in so many of our patient’s lives and that it affects their choices towards their health and wellbeing. I personally feel patients suffering from addiction are a subset of people that can get judged a lot but when we have room to consider their past we can see sometimes see how they have learned to fill a void in their lives. So leading up to Christmas my wish list is for us to see the human in front of us and in the mirror more. This week at work we talked about how mental health does not discriminate so in my view our kindness need not either. Part of being kind is being grateful when we can be, to remember to be thankful when we can be especially when considering others. I think that will make us naturally kinder to ourselves, as we allow ourselves to be more positive about what we have rather than what we don’t. I’d like to finish off and say it’s been my absolute honour to be part of the DAUK team and I endeavour to support the team through audiovisuals and opinion pieces for the time I can be useful! Great bunch of people and absolute grace when it comes to giving their time to help further doctors voices on a number of important platforms as you will hopefully continue to read within theses blogs and on this website. In April and May of this year, renewed attention was brought upon the issue of non EU doctors in large numbers being denied entry to the UK to take up posts they had successfully applied and interviewed for. We spoke to and helped cast a light on the case of Dr. Nnaemeka Chidumijie, a core surgical trainee who was denied entry to the UK to resume training after being asked to leave when changing visa categories. We drafted a petition with some 7300 signatures regarding the wider issue, and presented it to both the Home Secretary Sajid Javid, and Prime Minister Theresa May. With our members and Dr. Chidumijie being interviewed by multiple media outlets, the issue rightly became national news in May 2018. We were then messaged by multiple doctors in similar positions who were being threatened with deportation or prevented from entering the country. It was clear that this was an issue affecting trusts across the country and having a significant detrimental effect on those individuals and their families. We and the other grassroots organisations that were involved in this campaign, alongside the BMA and their efforts, were delighted with the eventual victory and consequent exemption of doctors and nurses from the caps on tier 2 visas. Despite a brief moment of concern in the last quarter of this year when this progress seemed under threat, we are happy to report that medical professionals remain exempt from this regulation and many who contacted us including Dr. Chidumijie have since managed to resume their work unhindered. As one of the co founders of DAUK, I have seen the organisation go from strength to strength and it has been an honour to be involved and to work with such committed people. Read more about the #ScrapTheCap campaign and our other efforts on our website and have a look at the petition we drafted. All the best and enjoy your Sunday morning! And read more about our current flagship campaign Learn Not Blame, and see how you can get involved today! Hi I'm Natalie and one of the new members of DAUK's editorial team. I would like to start by saying a massive congratulations to DAUK for the work they have done this year including the #LearnNotBlame and #Scrapthecap campaigns. They have really shown that so much can be done when people get together to work towards a common aim and I am really excited for what we can achieve this year! So now for my wishlist. Well it's Christmas, so I feel like we should dream big. If I could wish for one thing it would be a well funded NHS that remains free at the point of need. I wish that doctors were able to do their jobs to the best of their ability, not hindered by a lack of resources or staff. Something that in the current climate, is difficult to achieve. As a psychiatry trainee, so much of what I do is limited by the resources available and I feel often that we are letting our patients down. We need to say enough is enough and stand up and speak out about these limitations; to hold those to account who are responsible for these decisions and to raise awareness about these issues. Doctors should feel free to speak up and express concerns without fear of persecution. Many reading this may share my feelings but think there is little they personally can do about it. Well I want to say that I am just like you. I am not special or different. I am not experienced in politics or journalism or public speaking. I am a working doctor who cares and I am asking you to get behind DAUK in any way you can. If you have money to spare, please donate it; f you have time,please invest it but ultimately, all you need is a voice to spread the word and inspire those around you to do the same. One week till the big day and today it’s Cicely’s turn to tell you about her Christmas wishlist. What a whirlwind year it’s been! On the 25th January everything changed as I started hearing on social media about a junior doctor who had not only been convicted for gross negligence manslaughter, but also taken to court by her regulator in order to seek her erasure from the register. The injustice of every aspect of this distressed me so much that I couldn’t sleep and ended up phoning the Today programme producer in the middle of the night – Jeremy Hunt was asked the next morning about Hadiza’s case, and so my activism was born. 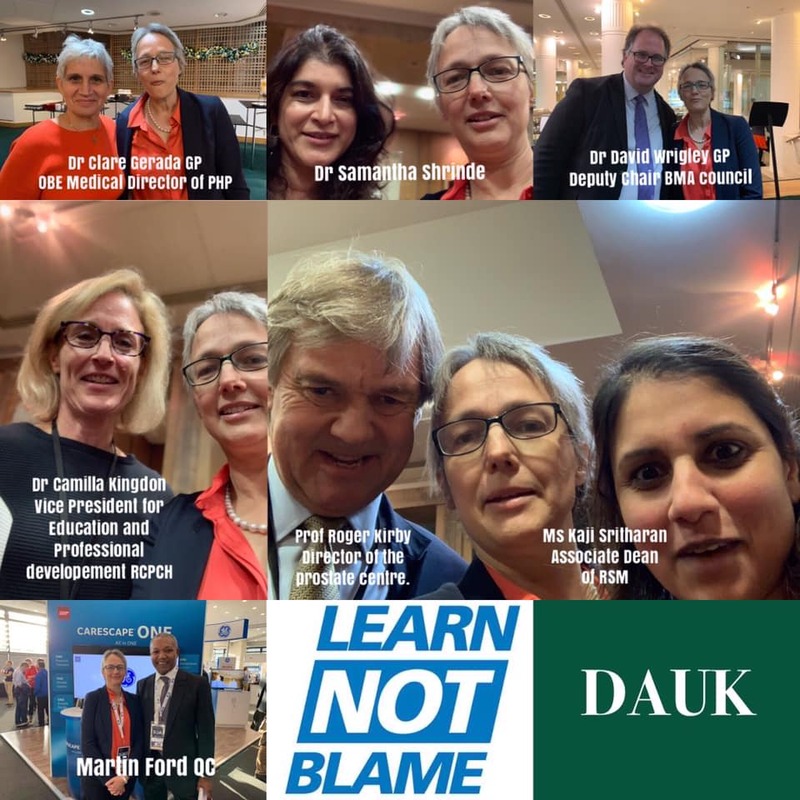 Over this year I have helped shape DAUK and developed the #learnnotblame campaign. I have discovered more than I would want to know about the murky underbelly of the NHS – of the deny and defend culture, of the bullying and harassment of whistleblowers and others who raise concerns, of the shocking way that patients and families who need answers in their time of grief are treated. Not to mention how doctors, who are just going to work to try to make people better, are treated by their employers, by the GMC, by their colleagues. But I also have met the most inspiring and amazing people, doctors prepared to stick their necks out, families who despite tragic and avoidable loss still campaign for a better NHS, and people who have experienced awful healthcare disasters wanting only for people to learn from it. And of course that group of passionate, committed doctors who have come together to form The Doctors’ Association UK to speak up for what matters to doctors and the NHS. The #learnnotblame campaign is, at its heart, a positive movement. It’s about what each and every one of us can do to nudge the NHS towards a better future. For some that’s about raising our voices publicly. But there are many other ways to do this. As well as DAUK, for me, it involves setting up a Learning from Excellence, or “Greatix”, scheme at work – to thank and reward staff for the good things they do. It involves planning a “Kitchen Table” event to bring colleagues together informally to discuss how to make our workplace better for staff and for patients. It involves running a session with junior colleagues on learning from mistakes. It involves quiet conversations with colleagues about why this stuff is important. So my Christmas wish is this: that everyone – who may have felt helpless and hopeless at times about the NHS in the last year – feels not only that they can have a voice through DAUK, but also that they can DO something. That they can BE part of the change that is needed. I hope you will join together with us in this – together we are stronger and we CAN make a difference. Sign up to the #learnnotblame campaign at www.dauk.org/learnnotblame. I’m Rinesh and I’ll be continuing the DAUK countdown to Christmas. As Vice-Chair and Treasurer I’ve been privileged to work with a fantastic group of passionate doctors who really want to see the changes in the NHS, General Medical Council and medical politics that are long overdue. So, what do I wish for Christmas? I thought I’d be indulgent and wish for two distinct things, something personal and something I think has been required in healthcare for a long time –robust whistleblowing protections. A more personal wish is for the health and happiness of friends and family for the future. Having recently had an experience of being the relative of a critically unwell patient I have had both the privilege of seeing a world-class health service and the utterly undignified way in which patients are sometimes cared for and failed by the system. I wish that in the upcoming year that NHS staff have the strength and resolve to do their very best for their patients, even through the most testing times. On behalf of The Doctors’ Association UK I extend Christmas wishes and good health to our members, their families and the million NHS staff, many of whom will be working over the festive period. Why have I brought up the topic of whistleblowing this Christmas? Well, firstly it’s a topic that I’m incredibly passionate about in the context of improving patient safety and preventing harm. It’s vital to achieving a just culture in the NHS where all staff feel empowered to speak out freely about poor practice or mistakes. This is key to DAUK’s Learn Not Blame campaign. There are a number of families that have been left with or faced the threat of financial ruin. Prominent recent cases of Dr Chris Day and Professor Edwin Jesudason, that of Dr Raj Mattu and Dr Steve Bolsin have all highlighted the personal cost and plight that individuals and their families face when blowing the whistle. For Christmas this year I ask that you not only think about close friends and family but also some of our colleagues who have sacrificed so much to keep patient safe. DAUK has gone from strength to strength this year. As a small team of passionate and committed doctors we have achieved real change and have started a national conversation about the culture in the NHS. I hope that we have your support for the coming year. Today is a special day, because - as I’m sure you all know - it’s Samuel L Jackson’s birthday. Also - less importantly, it’s four days until Christmas. I have a Christmas wish, for us doctors to share with you. As doctors, we are often expected to do our jobs with the most awful, outdated technology. My Christmas wish is for better technology for doctors. Specifically, better clinical data systems and better ways to communicate. "I Have Had It! With These Motherf*cking Snakes! On This Motherf*cking Plane!" "I Have Had It! With These Motherf*cking fax machines! In This Motherf*cking Hospital!" "I Have Had It! With These Motherf*cking Printers! And their Motherf*cking Paper jams!" "I Have Had It! With The terrible Motherf*cking User Interface! On This Motherf*cking Electronic Patient Record!" And I agree with this hypothetical Samuel L SpR. In general, the technology doctors use is slow, frustrating and badly out of date. . . But there are signs of light. The NHS has been told that from January, it needs to kick its fax machine addiction. To the horror of the last remaining fax machine manufacturers, the government has decided that the NHS either has to modernise or go back to strapping patient files to carrier pigeons. So, my Christmas wish is for this trend to continue. For doctors time to be properly valued, so that we are no longer expected to be data entry slaves to poorly designed Electronic Health Records, or clinical data systems. My Christmas wish is for doctors to become more involved in designing the technology that governs our practice and our lives, to benefit patients and the health system. And finally, my Christmas wish is to continue to be able to work with the fantastic team at DAUK. Promoting the Learn Not Blame campaign, and supporting doctors and their work. We live busy, demanding lives. We work sixty-hour rotas, take on academic commitments and experience multiple extra-curricular demands on our time. We don’t see our loved ones as much as we would like. We take pride in our ability to get by on six hours of sleep. We witness traumatic events and don’t talk about it. We don’t complain, discuss our feelings, or reach out to one another. We ‘get on with it’. After all, we all signed up to this, right? My Christmas wish would be that we all look after each other. It’s easy to put the blinkers on, enter survival mode and just try to get through the tough winter. We should fight this instinct, widen our focus and ensure we see how our friends and colleagues are doing. If you’re finding it hard, its likely that you’re not the only one. Check on them. Invite them for a coffee, or a pint if its a particularly dreadful shift. Even if just to let them know that they’re not alone. In the bleak midwinter, be the warmth that warms someone else. It’s now just two days before Christmas and this is my little wish list for us all. I am Law and Policy Lead at DAUK and founder of www.medicalmanslaughter.co.uk. I suppose my main plea is to keep caring for our patients and for each other, however challenging our situation. I would also encourage us all to be Risk-Takers (RT!) for good. By that I don’t mean that we become reckless, or eat, drink and be merry on all the wrong stuff (perish the thought!). I do mean that we should take on challenges that on the outside look impossible and/or step outside our comfort zone more in 2019. I’ve had a rich life so far, all 50 years of it (sshh!) but about a year ago I found myself lying in a scanner after I had been diagnosed with a very serious illness. It’s very hard to explain to anyone what that’s like unless they’ve been through it themselves. For years, and without hesitation, I had ordered such scans or viewed challenging pathology reports. The grating noise of an MRI and the coffin-like experience it offers all those inside it had never entered my head when I routinely ticked the box for my patients before May 2017. I think I always tried my best to explain to patients about drug side-effects etc., but on occasion I did impatiently cut them short. I felt the pressure to quickly find something else to help them, which again might not suit. Now I understand that what I really needed to do was listen and spend a bit more time with them, rather than reaching for the BNF before they’d hardly sat down. Nothing prepares you for reading your own pathology report when it’s not good news. I found myself having to read it over and over again hoping that in some way it didn’t belong to me, or that it was an awful mistake. Now it’s a shared experience when my patients have to cope with a report detailing a difficult diagnosis. I hope I’m more patient than I was. As we approach the end of this year, I am thankful to be very much alive and I have had renewal in my faith that this is, going forward, the way it’s going to be. The NHS was at its best for me throughout and I’m now back at my desk. Many of those who come in and out of my door ask me where I have been. I am frank about what happened and it does seem to help that I can personally share with them how it is possible to face those terrible twins, Sickness and Fear. I remain an amateur as despair, anger and frustration still pop back into my life on a frequent basis. Writing about facing the fact that your life might be cut short when you have young children might not sound like it should be part of a rosy Christmas message here at DAUK. However, this year has taught me that a greater perspective in life can be gained if you don’t worry about the small stuff. Also, you don’t have to be so concerned about upsetting large organisations. You can take more risks. I have the good fortune to know both David Sellu and Hadiza Bawa-Garba personally. I have seen their struggles at first hand. I firmly acknowledge the tragedy for the families involved in both cases, as they still try to come to terms with the patients’ deaths. However, I am convinced that the overwhelming feeling in the medical profession is utterly true: that what happened to them could have happened to anyone. I have been privileged to have actively participated with so many others to try to change the blame culture at the heart of these cases and feel encouraged that ‘The inside story of a six-year-old boy’s death, and the trainee doctor who took the blame’ reached 110 place on the chart of the most engaging stories of 2018. Deb Cohen’s piece went global so quickly because of the human tragedy of such a loss and the debate which surrounded what happened to Dr Bawa-Garba. Remarkably, it was a clear 4 places above ‘The Curious Case of Bryan Colangelo and the Secret Twitter Account’ and 8 places above ‘The Royal Wedding in Pictures’. ‘Learn Not Blame’ has to be the way ahead for both patients and healthcare workers. As a profession we must remain accountable, yet our patients must be kept safe by preserving an ability to openly learn from mistakes. Society, and its leaders, must take this on as a matter of the highest priority regardless of other competing demands. As a profession we have come together in unified action for culture change over the past year. This fills me with hope as we approach 2019, despite the chaotic politics of the moment. Let us keep being there for each other and for our patients. Let us take brave risks with projects we undertake and new friends we might make. Let us keep looking out for those we work alongside, especially those in difficulty, perhaps through bullying, or those agonising about whistle-blowing. Let us be strong and take that stand with them instead of looking the other way. We have never been in such challenging times and yet it is in rising to these challenges that we become our best. Happy Christmas everybody and I look forward to working with you for years to come. What a year it’s been. It’s hard to believe that this time last year DAUK didn’t even exist. People often ask how we have been able to achieve so much in a short space of time, and that’s very kind. But the truth is, we are just a bunch of ordinary doctors, drawn together after seeing one of our colleagues being thrown under the bus, who wanted to stand up and actually change things. Lightning rods like Bawa-Garba, the junior contract, Chris Day, MTAS are symptoms of a profession having their rights slowly eroded. But if we allow ourselves to see the silver lining, these crucial moments haven united us, and turned ordinary doctors in activists, who have finally come together to say enough is enough. Social media, for all it’s perils, has seen a switch up of the hierarchy and placed the power into the hands of ordinary doctors. Change no longer comes from the top down, but through the pressure of the grassroots. I’m not going to lie, it’s been bloody hard work. All of our committee does this for free and we wouldn’t change that. We’ve faced criticism at times, some of warranted, which has led to us finding new ways of doing things. We’ve been finding our feet as we go and it’s been a steep learning curve, and I’ll be honest in saying I’ve considered throwing in the towel more than once. But the support we’ve received from doctors has been overwhelming. You may not realise it, but your messages of support, your quick emails, tweets and PMs are all read by the committee and you’ve kept us going. And over the past year I’ve seen so much good amongst our profession. It is incredible, really, when you think doctors raised £300,000 to help a scapegoated colleague appeal a wrongful verdict in just a few days. Leading this team, watching an Oncology Registrar take on Matt Hancock, a GP take on the CEO of the GMC, an Anaesthetic trainee take on the Home Office, I could not be more proud of such a wonderful group, all supporting each other to take a stand for all doctors. And none of this would have happened without immense pressure from the grassroots, so thank you to each and every individual doctor who has supported us, signed our petitions and letters, shared our work and donated to our campaigns. So what is on my wish list? Here’s what I really want to say. Many of us have felt disenfranchised, demoralised, overstretched and overworked with conditions getting worse all of the time and no way to change things for us or the NHS. For me, DAUK is about empowering doctors, giving them a voice and a way to change things for the better. From the new year, we will be offering our members new ways of becoming more closely involved with our campaigns, sitting on working groups and highlighting to us the issues that doctors care about, to allow us to lobby on your behalf. So join us, be part of the change, and I hope we can count on your incredible support for another year. Merry Christmas, especially to all those joining me on mince-pie fuelled nights over the next few days.